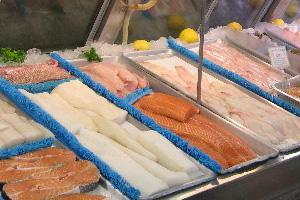 For over 30 years The Seafood Shop has been providing the highest quality and selection of food in the Hamptons. Our name says seafood which of course is our specialty, from fresh whole fish packed out by local fisherman in the back of the store to the most succulent poached salmon you've ever seen in the front. Our beautiful array of prepared foods is enjoyed by some of the most discriminating palates in all The Hamptons. Our Catering is the icing on the cake. Give us a location, we'll make you a party with atmosphere and food that will be the highlight of your summer, and your guest's. So when your next in town stop by and visit us. We're right in the middle of Wainscott on Rte. 27, directly across from the Post Office or give us a call. Along about 1972 two teachers from area schools, Robert Wilford and John Haessler, began a small fish market on Montauk Highway in Wainscott, Long Island. For the first few years it was just a summer business as was many in the area at the time. Local baymen would bring their catch in through the back door to be fileted, steaked or left whole, and displayed for the folks coming in the front door. Not much has changed in that way. After some years John Haessler became the sole owner of The Seafood Shop. He decided to move on from the teaching profession to keep the shop open 7 days a week, year round. With his determined work ethic, John soon became known to chefs (in and out of restaurants) from here to New York City. The freshness and selection of fish provided at The Seafood Shop was (and still is) the best, bar none. Of course, John had plenty of help over the years. Eric Krom, Barbara Wyeth, Colin Mather, Peter Ambrose, Ken Reney, Alex Fausto and Billy Doroski are just some of the names that have oiled the gears of The Seafood Shop over the years, and still do. It's not just a job to us, it's our family. On January 1st, 2000, after almost 30 years of dedicating his life to the progress of The Seafood Shop, John Haessler decided to put the same amount of time and energy into his family and hobbies. Colin Mather, after spending 13 years under John's tutelage took the reigns that day. Yes, Colin's made a few physical changes, but certain things remain the same. We still provide the "freshest and finest" and every one of our customers is treated like family. You know, the years at The Seafood Shop read like a story with lots of colorful characters. So, get your name on the page and come on in. We'll be looking for you.